It’s a link up! I finally got around to installing the link widget to turn Thursday Things into a link party. Details on how to add your link below! Here are five things going in our world. 1. Going on a mini-vacation has totally thrown me out of whack. Is it just me or do you feel like you’ve aged ten years once you return home from a long weekend? It takes me at least a few days to recover from traveling, and I can say the same for the babies! Since we’ve been home, they’ve been so grumpy. But I blame that in part on teething. 2. Since I missed out on a week of workouts, I’ve been overdoing it a little bit this week. I tried jogging with the stroller and that did not go so well. I was using my Couch25k app, and it just happened to tell me to run when I was coming up on a small hill in our neighborhood. I wanted to push myself, so I went for it and almost ate it! I think a passing car might of slowed down a little bit to make sure I wasn’t going to fall down. How embarrassing! I definitely have some shaping up to do before I’m ready to jog with the babes. 3. Operation play room is still in progress. I’ve been lazy, but I will have lots of cute crafts to share soon. My sister even got in on the play room design action and made us a super cute wreath! 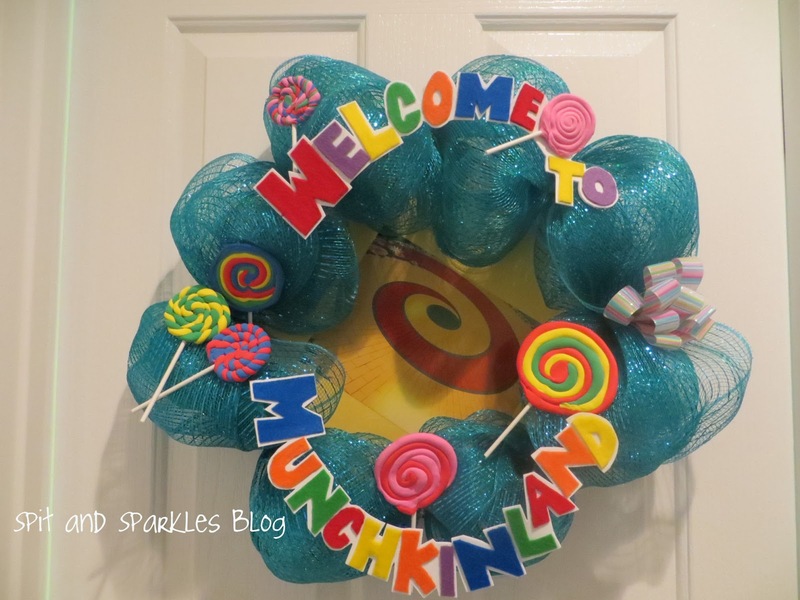 I requested a welcome wreath for the door to the room, and wanted a Munchkinland theme. I was so excited to see what she came up with, and it is perfect for our Oz inspired room. Stay tuned for the reveal! 4. I am very much looking forward to Saturday. I have a facial, mani/pedi and massage scheduled. It’s long overdue, since I got the gift certificate for my birthday back in February. But, I’m kind of glad I saved it. I repeat… I feel like I’ve aged ten years after that trip! 5. I’m looking for a new book to read. When I was pregnant, I pretty much stopped reading for enjoyment. I read baby books and books on breastfeeding and parenting magazines. I miss reading, and it’d probably be good for me to replace Candy Crush Saga with actual intellectual stimulation. I have a serious addiction! So, recommend some for me! I like mysteries, historical fiction and books about faith. Not jUst the twins. .. Levi has been really cranky too!I hope everything with the playroom is going good! And yet Lisa Jackson books. .. they are really good. .. the ones in the new Orleans series are the best! Awe, poor little bug. It could be from his shots yesterday. Hope he feels better! Much better today he got to spend a few hours with daddy too while I went and took an exam. Have you read “Thorn in My Heart,” “Fair is the Rose,” and “Whence Came a Prince” by Liz Curtis Higgs? Seriously my very favorite historical faith-based series (and I worked in a library for 7 years so I saw a lot of books). They’re set in Scotland in the 1600’s but vaguely tell the Biblical story of Jacob, Leah & Rachel. I have read them at least 5 times and I keep going back to them time and again instead of finding something new to read. I haven’t read them! I will definitely check them out! Thanks for the rec.